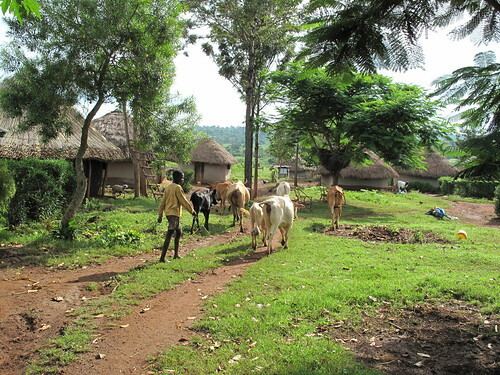 Typical mixed crop-livestock farming of western Kenya. Many smallholder farmers in western Kenya are taking advantage of the growing demand for pork to keep free-ranging pigs as a commercial enterprise (photo credit: ILRI/Pye-Smith). Many people are familiar with the use of global positioning system (GPS) technology as a security measure to track the movement of vehicles, mobile phones and sophisticated high-tech gadgets and assets. But researchers at the University of Edinburgh and the International Livestock Research Institute are using GPS technology to track the movement of a different kind of asset that, though not motorized or electronic, is nonetheless of great value to resource-poor farmers in rural western Kenya: free-ranging domestic pigs. In western Kenya, as in many parts of the developing world, rural households keep pigs under extensive, low-input systems where the animals are left free to roam and scavenge food outside the homestead. Such low capital investment production systems enable smallholder farmers to benefit from pig production by taking advantage of the growing demand for pork, especially in urban areas. It is well known that irrespective of the production system under which they are kept, pigs can be the host of a variety of disease-causing microorganisms. However, pigs that are left to roam freely and scavenge food have a much higher risk of picking up diseases and infections like the pork tapeworm and African swine fever and passing them on to other domestic and wild animals as well as to people. Understanding the movement patterns of free-ranging pigs in a rural setting can help animal health researchers develop effective disease control policies for smallholder pig production systems, based on a better understanding of the patterns of disease transmission within populations of free range pigs. The results of a year-long pig tracking study carried out in Busia, western Kenya between March 2011 and February 2012 are now available in the March 2013 issue of the open access journal BMC Veterinary Research. The pigs were fitted with GPS collars that tracked their movements and recorded their location coordinates every 3 minutes for one week. The location data were then transmitted to a central GPS server for analysis. Blood samples were also collected from the pigs to check for infection with gastrointestinal parasites. “This is the first study to use GPS technology to collect data on the home range of domestic pigs kept under a free range system and the data will give us new insights into the behaviour of free-ranging pigs in a resource-poor setting,” the authors say. The study found that the free-ranging pigs spent almost half their time outside their homestead of origin, travelling an average of 4,340 metres in a 12 hour period. This result shows that with respect to pathogen transmission, the village environment beyond the farm matters just as much as the environment on the farm itself. In addition, the researchers found that free range domestic pigs spend a lot of energy while foraging and this reduced their potential for weight gain and economic benefit to their owners. This is because the sale price is normally pegged on the live weight of the pigs: a heavier pig translates into more cash for the farmer. “The movement data can also be combined with information on ration formulation and daily weight gain to provide farmers with advice on how to change their animal husbandry practices to improve the profitability of pig production,” the authors conclude. Find out more about the Zoonotic and Emerging Diseases Research Group which is led by co-author Eric Fèvre.